Jennifer graduated from the veterinary technician program at Seneca College in 2001. She spent several years working in medical research at the University of Toronto before moving to general practice. 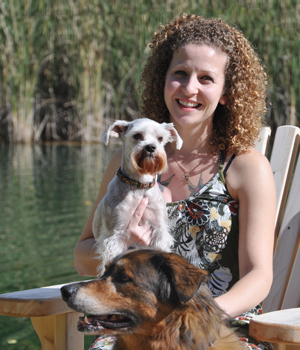 Jennifer was born and raised in Mississauga but moved to Guelph in 2010 to work in veterinary referral medicine. Jennifer also has experience working in veterinary emergency medicine and has a special interest in both dentistry and critical care nursing. She joined the Campus Estates team in January 2013 as a part-time registered veterinary technician. Jennifer enjoys the domestic arts including cooking, sewing, gardening, and backyard chickens. Her free-ranging flock of 6 hens are her constant gardening companions and a source of endless entertainment. Jennifer’s indoor flock includes her husband, Elsie (a miniature schnauzer), Drake (a giant retriever mix), and the cats (Oscar, Sanyo, and Chumleigh).